Bernal, who earned the highest award bestowed upon an athlete in Colombia when he was awarded the Athlete’s Award presented to him by the Colombian President, said he is looking forward to getting a new pair of gloves. Roeckl Gloves, which are available at Premier’s website and in their catalog, are available in the Regent Glove, an all leather sports design made from buttery soft leather with an elastic wrist and snap. Considered Roeckl’s most comfortable schooling glove, they are also great for driving. The Chester is a German-designed synthetic leather glove by Roeckl that combines style and versatility and features a textured palm and Velcro brand closure. Premier Equestrian is considered America’s leading manufacturer and distributor of dressage arenas and were chosen as an official supplier to the Alltech FEI World Equestrian Games in 2010. 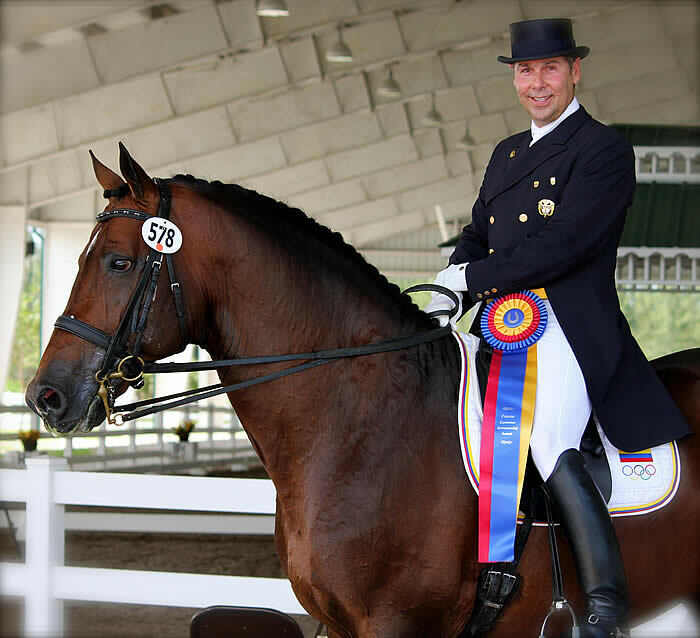 “Our products are world-class and they are well received by the international dressage community,” Zorn said. Premier Equestrian also offers a complete line of horse jumps and horse jumping equipment. Including jump standards, gates, walls, jump cups, horse jump poles, sponsor jumps, and cavaletti. For more information on all Premier Equestrian products, including footing, dressage arenas, jumps and stable accessories, visit their website at www.PremierEquestrian.com or call 800-611-6109.